Let me tell you about how much I love potatoes. Fry ’em, mash ’em, put ’em in a stew; I’ve never met a potato I didn’t love. Same goes for the Holy Potatoes! series of video games from Daylight Studios and Rising Star Games. There are three in the series, and the first one, Holy Potatoes! A Weapon Shop?! is now available to PlayStation 4 gamers. 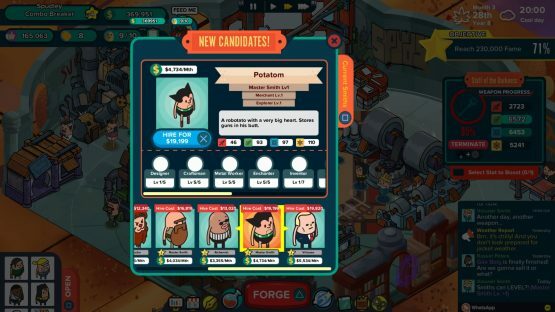 Of the many shop management games I’ve purchased and played on Steam, Holy Potatoes! is by far my favorite. You’re a young Potato, summoned to your Grandtater’s dusty old workshop by his extremely shady “business partner,” an Agent 46. He’s a bit of a greedy S.O.B. and wants you to start up the forge once more because he needs that sweet $tarch (the in-game currency) for some reason or another. So what is an eager young Spud to do? Why, follow in his grandfather’s shoes, of course. The core of Holy Potatoes! 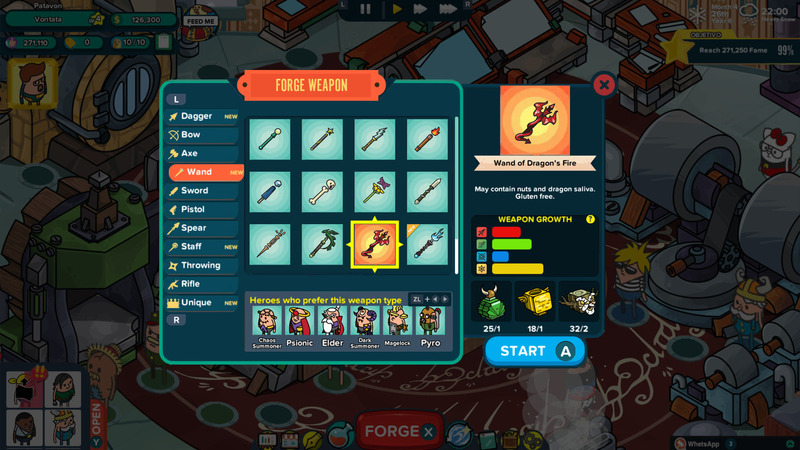 A Weapon Shop is forging weapons to sell to local and traveling spudtacular adventurers. With just three blueprints and three work stations, the success or failure of your grandfather’s legacy rests on your shoulders. As your workshop grows, you can place multiple workers at each station to aid in increasing the stat associated with it, which comes in handy for certain requests. You’ll also notice that they level up and can master the station they’ve been assigned to. Keep on top of your workers, because there is a skill tree involved which will prove beneficial as you unlock new regions in the game and your Heroes request rare weapons with varying high stats. There are two unique types of Forging available outside of what you sell to the common villagers. First up you’ve got the Contracts. Contracts come in a variety of flavors from Cakewalk to Hard, and each one asks that you meet said requirements within a given time limit. This is where moving your workers to the appropriate stations is in your favor; if you leave them on a station that doesn’t pertain to the Contract, none of it counts. You’ll watch them dance away with zeroes floating over their noggins. Sometimes a wandering adventure will stroll into the workshop and ask you to create a weapon for them. Like the Contracts, they may ask for particular stats to be high on a weapon. They may also request a certain type of weapon or even a prefix to be attached (we’ll talk about prefixes in a bit). You’ll always have a timer on these types of requests so be sure to start them right away if you accept them. Hint: You can choose to decline these without worrying about missing out on trophies. Hero Requests are a little bit different. When certain Heroes come knocking at your door, they will provide you with a blueprint that notes the stat requirements. You can do these at your own pace as your craftsmen hone their skills. If you fail at making the item there is no need to panic; the Hero will simply tell you it’s not good enough and let you have another go at it until you can fill the order. Now that we’ve covered the bulk of things, let’s talk about making money. Because money is what makes a shop run, after all, and that Agent 46 takes a hefty cut. Once you have weapons to sell, you will head off to the World Map and select a location where you can sell to carb-thirsty thieves, wizards, and the like. Pay attention to what types of weapons the locals like and dislike, and choose accordingly from your weapons chest. 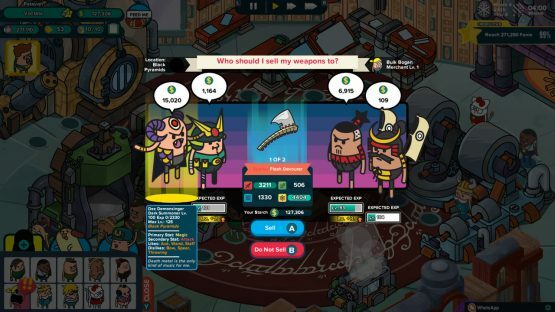 Sell your weapons for either the most $tarch or to best increase an adventurer’s level, whichever helps you meet your current objective. Over time you’ll be raking in the money, upgrading the shop, and bettering the lives of your employees. Some of those vacation packages are not cheap, and a disgruntled employee is not a productive employee. $tarch is also going to come in handy for recruitment. As your workshop levels up and you travel to new destinations you will be wanting to add more staff to the roster. When the ad campaigns end and you see what sorts of craftsmen have applied for the job, you’ll need to pay them a hiring bonus. The better or more well-known they are, the higher their initial asking price. Tony Starch doesn’t work for peanuts. If you are a completionist, this is also an important bit of information: do not head off to a new area until you’ve made sure that you have discovered every piece of material available in your current area and researched every combination. If you leave a relic behind, it is gone forever and that’s one less weapon you can research. The game also reminds you before heading to greener pastures of this and that anything not researched will be lost, but as someone who has accidentally button mashed past this before, I feel it is my duty to point this out. I jumped at the opportunity to do a Holy Potatoes! review and not just because I was looking for any excuse to play it all over again. 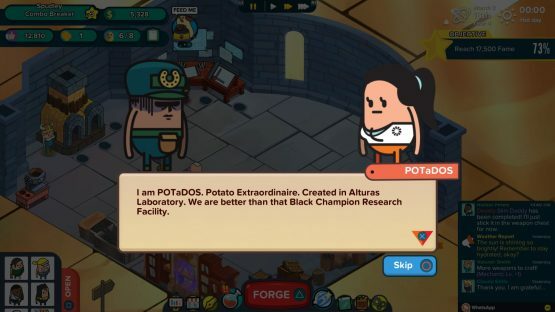 I absolutely love the ridiculous puns, the pop culture references, and the riffs on (in)famous video game characters as potato people. Sure, Circle Xine and Komani win all of the Golden Hammer Awards in the beginning, but now it’s Annette’s turn to win all of the trophies without having to bribe the judges! Annette gets to have all the $tarch! And why isn’t there a $tarch bin where I can swim around in the crushed souls of dead potatoes? This bathtub full of instant potato powder isn’t doing it for me. Holy Potatoes! A Weapon Shop?! review code provided by Rising Star Games. Version 1.02 was reviewed on a standard PlayStation 4 system. For more information on scoring please see our Review Policy here.